There are numerous responsibilities that come with owning a business and require your attention -- and quite frankly, the last thing you need is something that gets in the way of your traditional means of operation. Whether you’re in a retail or corporate setting, any interruption is a big factor in overall workflow and ultimately success. 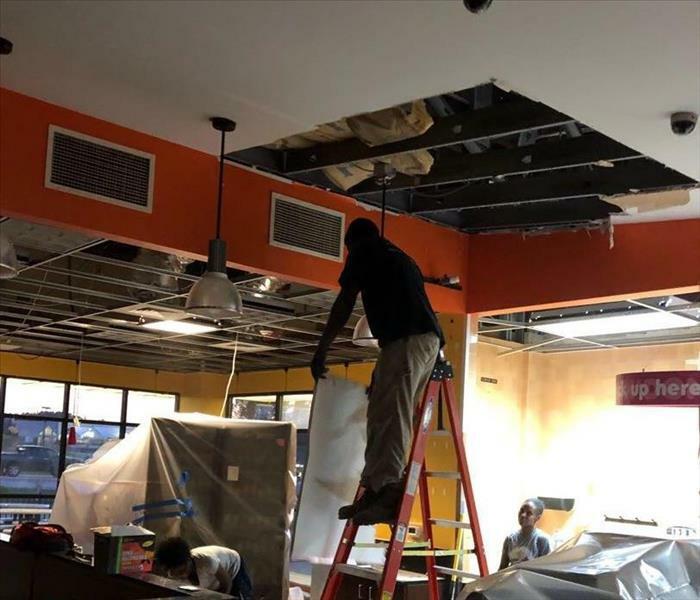 When disaster strikes, SERVPRO of East Meadow/Westbury will be there to assist in getting your business back up and running as soon as possible. We are on call, all of the time. With 24/7 emergency dispatch services, we’re prepared at all hours to assist with fire, water, mold, biohazard and other types of damage when they occur. Our equipment, training and local experts make the commercial remediation process quick and effective -- just as it should be. We are thrilled to have the opportunity to serve local Nassau County businesses that keep our local community bustling on a daily basis. We work to no end to minimize any of these interruptions you may be facing. With all remediation comes some form of cleaning, and our team is well-experienced in that facet. We offer preventative maintenance for upholstery, carpet and more to keep your space clean in the areas in which it’s most important. Deep cleaning, odor removal and many other services are available for all structure types, leaving no damage stone unturned. SERVPRO of East Meadow/Westbury is here to help in any way we’re able.